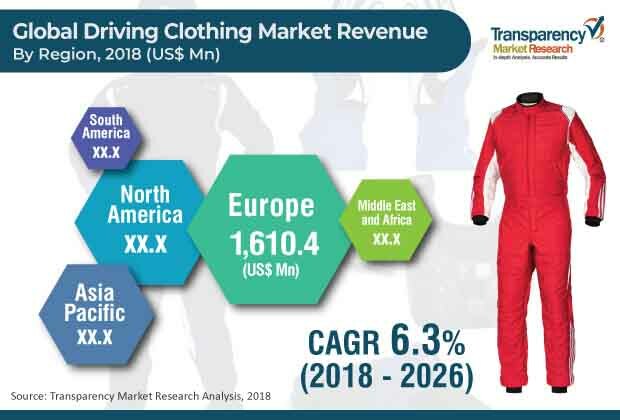 According to a new market report published by Transparency Market Research titled “Driving Clothing Market – Global Industry Analysis, Size, Share, Growth, Trends, and Forecast, 2018 – 2026,” the global driving clothing market is expected to reach a value of US$ 7,698.5 Mn by 2026. The market is estimated to expand at a CAGR of 6.3% during the forecast period from 2018 to 2026. In terms of volume, the market stood at around 22,855 thousand units in 2017. Europe dominated the driving clothing market in terms of value in 2017, acquiring approximately 33% of market share. The driving clothing market is influenced by the increasing popularity of motorsports. Advent of new and highly entertaining race sporting events such as Formula One, Indy Car racing, NASCAR racing, FIA World Endurance Championship, Motorcycle Grand Prix, Super Bike Racing, Dirt Bike racing championships etc. has become popular among the population globally. This has resulted in increased demand for driving clothing. Additionally, heightened personal awareness about safety due to increased road accidents has also resulted in creating more demand for driving clothing. Furthermore, stringent safety regulations globally has resulted in boosting demand for driving clothing. Based on product type, the jackets segment dominated the market in 2017 and was valued at US$ 1,956.9 Mn at a CAGR of 6.8% due to its widespread application across the globe. Based on material type, synthetic materials acquired major market since they are lightweight and affordable. Synthetics materials are preferred in professional racing because of added features such as heat resistance and abrasion resistance. Additionally, companies manufacture synthetic clothing based on requirements such as ventilation for sufficient air flow inside the body. According to end-user, men’s segment acquired major market share of approximately 69% in 2017 due to more male participation in driving vehicles compared to female riders. According to vehicle type, the two-wheeler segment dominates the market due to presence of more two-wheelers compared to four wheelers. Moreover, safety concerns are more in two-wheelers, thus creating more demand for driving clothing from two-wheeler users. According to distribution channel, the online channel is anticipated to grow at a faster rate of approximately 6.7% due to availability of wide product portfolios at a reasonable rate. Additionally, manufacturers are coming up with their company owned websites, thereby providing more genuine products. Some of the key players in the driving clothing market include PUMA SE, Adidas AG, Under Armor Inc., Alpinestars S.p.A., Dainese S.p.A., Fox Head, Inc., Scott Sports SA, ThorMX, OMP Racing S.P.A., 3D Industries etc. The key players adopt numerous strategies to sustain in the market. Product development and acquisition and partnership are some of the main strategies adopted by key players to gain a competitive edge.